India election 2019: Has security improved under Modi? Ahead of the Indian election, which gets under way on 11 April, the main political parties are arguing over who has tackled national security more effectively. The opposition Congress party - which held power from 2004 until 2014 - says that terror incidents have risen by 260% and infiltration by militants across the border has doubled under the current BJP government. The Congress also says that almost four times more militants were killed under its rule than during the current administration. But the claims made by the Congress party appear to relate to the Indian-administered Kashmir region only and not the rest of India, so we'll first focus on the available figures for this area. There has been an armed insurgency by militants against Indian forces in Kashmir since the late 1980s. Both India and Pakistan claim all of Muslim-majority Kashmir but control only parts of it. Tensions between the two nations escalated in February after India carried out air strikes against what it said was a militant camp based in Pakistan and the latter retaliated with air raids. Indian government data shows terror-related incidents in Indian-administered Kashmir were in decline from the early 2000s until 2013 but have been on the rise in recent years. The Indian government's current legal definition of terrorism is: acts with the intent or likelihood to threaten the unity, integrity, security or sovereignty of India or with the intent or likelihood of striking terror in people. According to the Indian Home Ministry, there were 170 such incidents in 2013 in Indian-administered Kashmir, compared with 614 in 2018 - an increase of 260%. This matches the figure tweeted by the opposition Congress party. However, if you take a broader look across both the current BJP administration and the previous Congress-led government, you find a different story. The levels of militant activity over the two periods are very similar. Between 2009 and 2013, under the Congress-led government, there were a total of 1,717 incidents. From 2014 to 2018, under the BJP, there were 1,708. Data for the year 2018-19 has not yet been released. What about the Congress claim that 4,239 militants had been killed by India's security forces under its rule compared with 876 under the current BJP government? It looks like Congress may be comparing its two terms (2004-14) with just the current BJP administration (2014 onwards). The data it used matches figures from the South Asian Terrorism Portal (SATP), an independent non-governmental group that compiles figures both from government sources and media reports. The Congress claim does not make it clear that it has added up fatalities over two Congress terms. And if you compare official government data for militant deaths during the current BJP administration with that of the previous Congress government (2009-13), 128 more militants actually died during the BJP years. The Congress opposition also says that infiltration attempts have doubled under the BJP government. But, as with its other claims, the party does not specify whether this refers just to the Kashmir region, which is seen as the biggest national security issue. 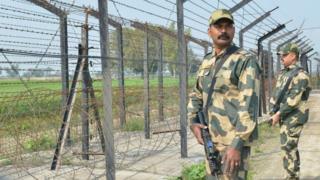 India accuses individuals belonging to militant groups of trying to enter Indian-administered Kashmir. Official records show 1,762 such attempts were made between 2009 and 2013, when the Congress was in power. And the period from 2014 to 2018, under the current BJP government, saw 1,456 attempts made. Since 2016, infiltrations have been on the rise, although many more attempts have also been foiled. Is India now a space superpower? When will broadband reach all India's villages? What about elsewhere in India? The north-eastern region has seen ethnic and separatist conflicts for decades, involving a variety of groups fighting for local autonomy or complete independence. But, except for a spike in 2012, there has been a decline in reports of violent incidents - and a sharp fall in civilian and security personnel deaths since 2015, according to official data. "The year 2017 witnessed the lowest number of insurgency incidents since 1997" in this region, according to the Home Ministry. Elsewhere, Maoist rebels, who have been active in several eastern and central states, say they have been fighting for communist rule and greater rights for tribal people and the rural poor. The BJP says this left-wing insurgency has also declined in recent years, claiming that 3,380 Maoists surrendered between 2014 and 2017 - a figure also mentioned by Mr Modi in an interview last year. And the South Asian Terrorism Portal gives this figure as more than 4,000 - based on both official data and local media reports. But there have been concerns voiced about whether these figures include people who are not really combatants. Incidents related to left-wing violence have also been declining since 2014 - but the Home Ministry itself says this trend began in 2011, when the Congress was in power.